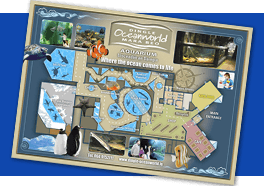 Welcome to the Dingle Oceanworld Polar Penguin Exhibition! 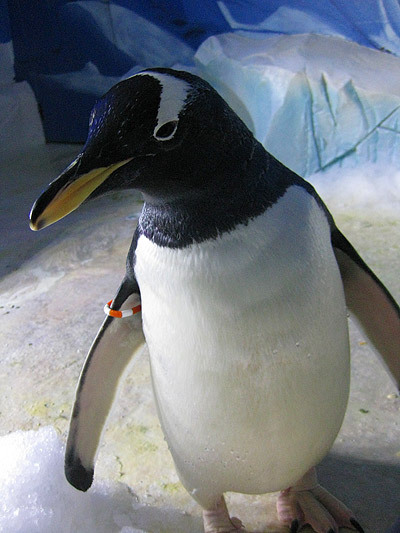 Gentoo penguins are a very distinctive looking penguin, with a bright orange beak, white stripe over the head and lovely pink feet. 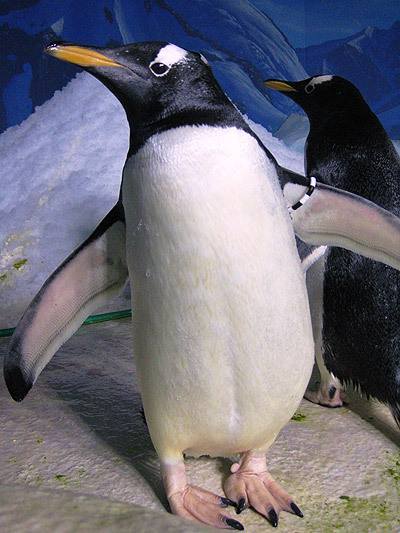 They are the third largest penguin species in the world, reaching a height of between 70-90 cm. 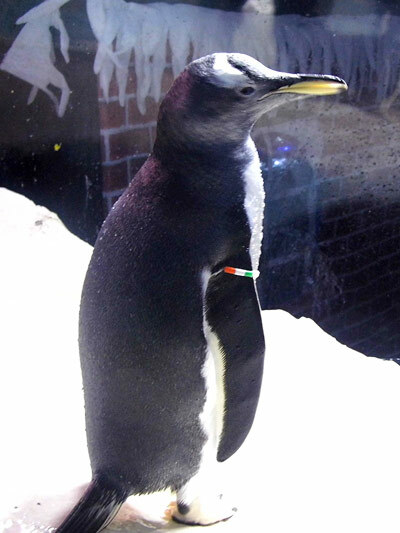 They are found on the Antarctic Penninsula, and the Islands that surround it. Due to the fact they thrive in colder temperatures, here at Dingle Oceanworld our penguins live in a purpose built enclosure, at temperatures between 6-11 degrees celcius, which vary as the seasons change. The penguins also benefit from a snow machine that produces half a tonne of snow and ice a day for them to play in or hang out on. 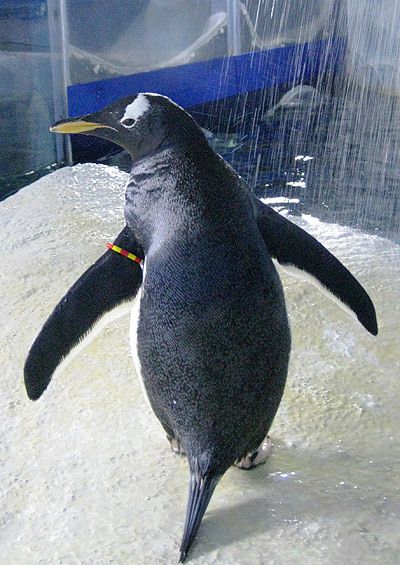 We have 12 penguins who moved to Dingle in April 2011, from Oceanopolis in Brest, France; and Edinburgh Zoo in Scotland. They have all been captive bred and have settled in very well. 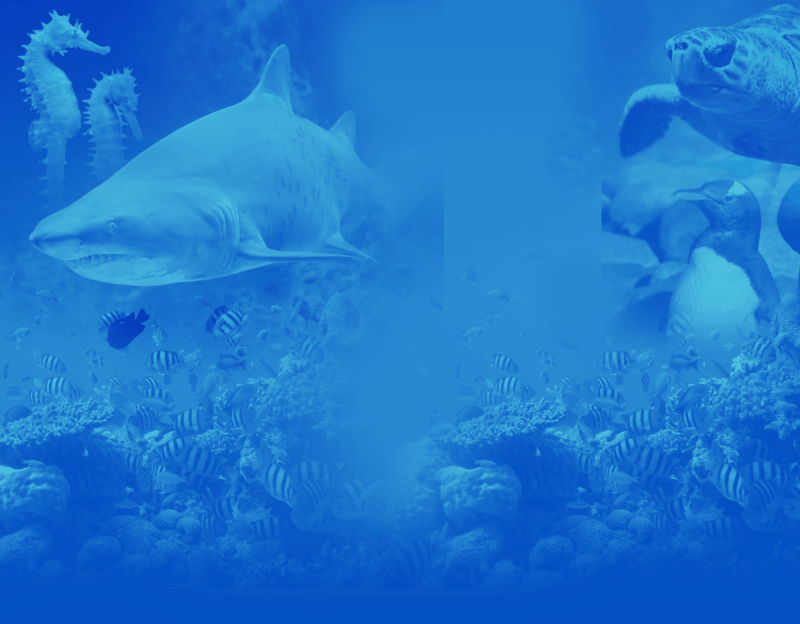 They eat a variety of fish, krill, squid and mussels, and feeding time is definately a must see event. They are fed at different times throughout the day, but you can always see them have their lunch at 2pm daily. They have a yearly breeding season, preferring not to rest their eggs on their feet, instead they build nests out of rocks and twigs. The male attracts the female with his ‘song’. The female lays 2 eggs, then the male and female take equal turns in incubating the egg. It hatches after 35 days. Once again the parents take equal turns in feeding and raising the chick. By around 2 months of age the chick has fully grown and leaves the nest to join the colony as an adult. 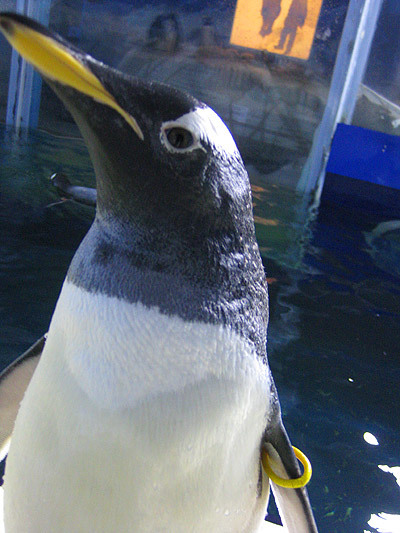 Gentoos are the fastest swimming bird in the world. They reach speeds of up to 40km/h. They can also dive to deeper than 100m, holding their breath for up to 7 minutes. They are very athletic on land, able to outrun humans, and climb sheer rock faces using the strong claws on their feet. 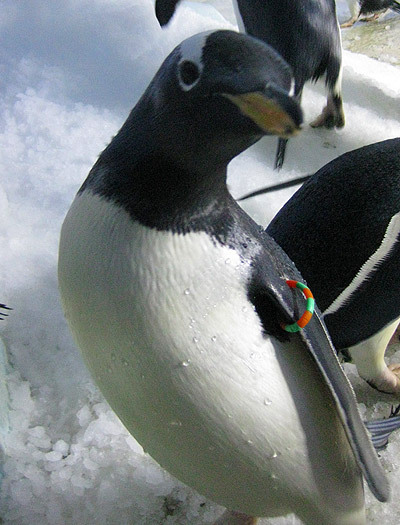 All our penguins have coloured wing bands to help the keepers identify them easily. Why not see who you can spot when you visit? Female. Born in 2008. Missy is a fun loving girl, confident and brave. She loves playing and interacting with visitors through the large windows of the enclosure. Female. Born in 2009. 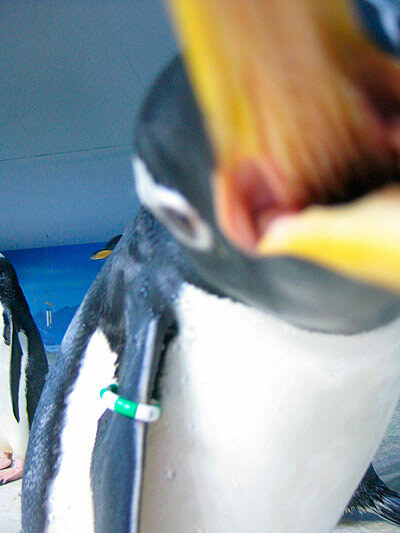 Kerry is a bossy boots who likes to tell the other penguins what to do. She also very noisy and spends a lot of time following the keepers around nattering to let them know she is there! Male. Born in 2014. First Gentoo Penguin born in the republic of Ireland, born here at Oceanworld aquarium. His parents are Fletcher & Sneachta. 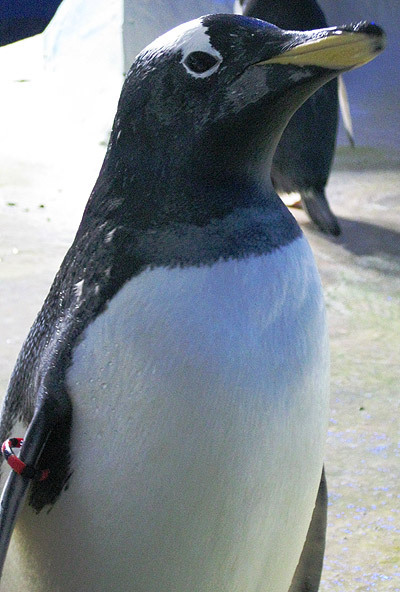 Uisce is a very playful and noisy penguin and chats a lot! Male. Born in 2007 . Patrick is always keen to play with new toys, but also enjoys spending time chilling out and keeping his feathers in top condition. Friendly with all the other penguins, the only time to watch out is at feeds, when he gets over-excited and tries to eat keeper fingers as well as fish! Male. Born in 2007. Fletcher is a bit of a sensitive fellow, and should always be treated with the utmost respect. Given time to relax and adapt to new things, he gains confidence and loves to play. Born in 1989. Charming and charismatic, Hugh is full of manners and dignity, unlike some of the other rabble! The oldest of the group, Hugh shows the others how they should behave, but they never follow his example. He can always be found by the feet of his keepers at feeding time, waiting patiently for his turn. What a gentleman. Born in 2004. 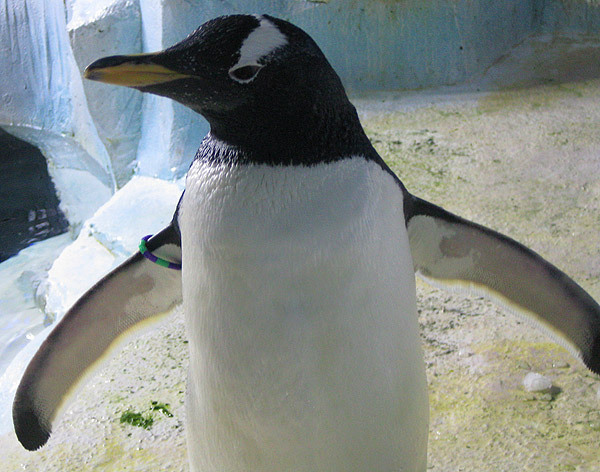 Candy is a shy lady around people, but enjoys being with the other penguins, especially Hugh. The two paired up many years ago and are going strong. They can often be seen courting each other and revelling in each other’s company. Born in 2010. 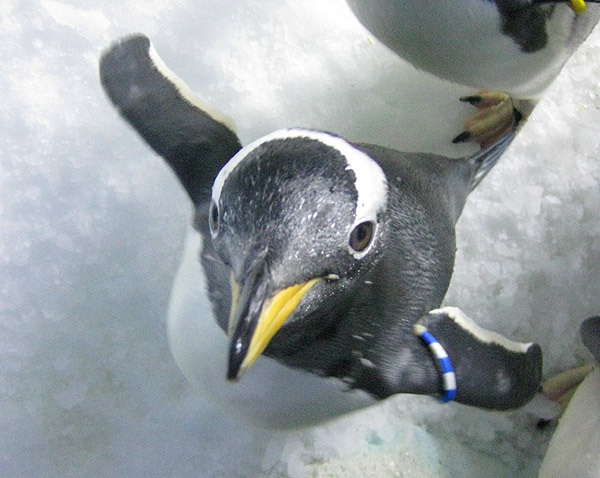 The youngest of the bunch, Bubbles is sweet natured and always up for getting involved in the games and larks of the other penguins. She loves her keepers, and like Pip, can often be found helping with the cleaning and observing to make sure we do our job properly! Born in 2010. Sneachta, as her name suggests (Sneachta is Irish for snow) loves playing in the snow. Whether it’s diving after snowballs, climbing to the top of the snowpile or hunting for fish hidden in the snow, Sneachta is always first in and last out! Born in 2010. T.C. has buckets of character, to match his size! The youngest of the boys, T.C likes to think he’s the boss of everyone and tries to ensure he is first in line for fish every feeding time! Despite his boisterous manner he is a lovely chap and we hope he will grow into a fine well mannered penguin. Female. Born in 2007. She is a bit shy but absolutely loves swimming, preening, and keeping herself looking clean and beautiful. Sven our newest arrival was born in Scotland in 2008, he travelled all the way from Denmark to be with us here in Dingle. In honour of this we named him a Danish name made very popular by the movie Frozen! Odin was born in Scotland in 2008 and travelled from Denmark with Sven. He is a more reserved penguin than Sven so we named after the Nordic God Odin.